You are here:Home / Interiors / How Do You Say Italian Caffè in Starbucks? 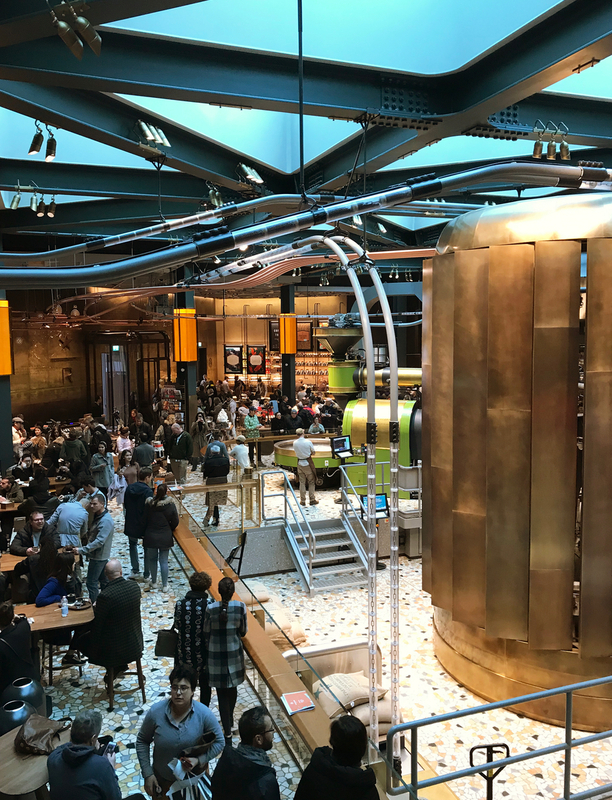 The Seattle coffee chain that got its inspiration from Italy has opened a blockbusting experience in an old post office in Milan. Many years ago when I lived in Milan, I shared a flat and jokes about Italians with an American girl. It was our way of asserting our new world sense of superiority when clearly we were in awe of the old world cultural riches that surrounded us. The one that inevitably provoked a certain outrage conflated how Italians make love with how they drink coffee. Short and expresso’d. 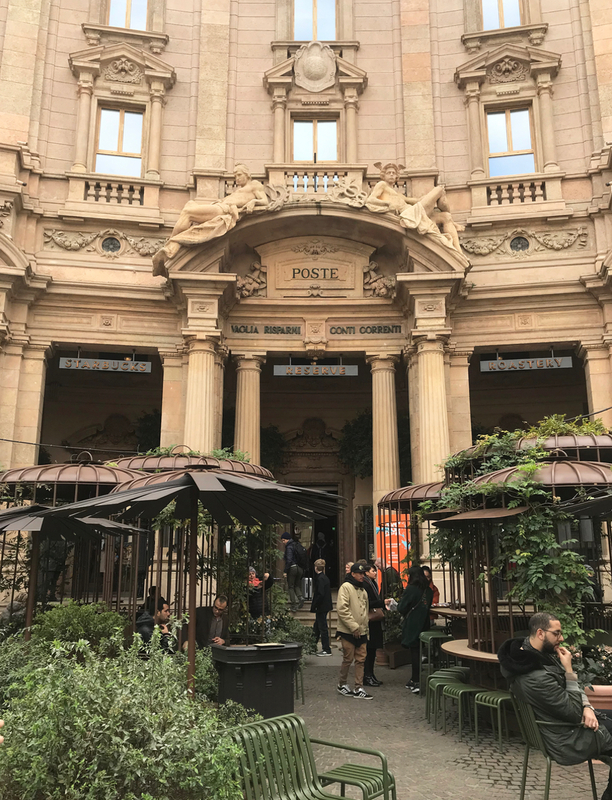 Starbucks is betting that they will do it often, and perhaps even decide to linger in the new roastery that opened in early September in the majestic old post office in Milan’s Piazza Cordusio. 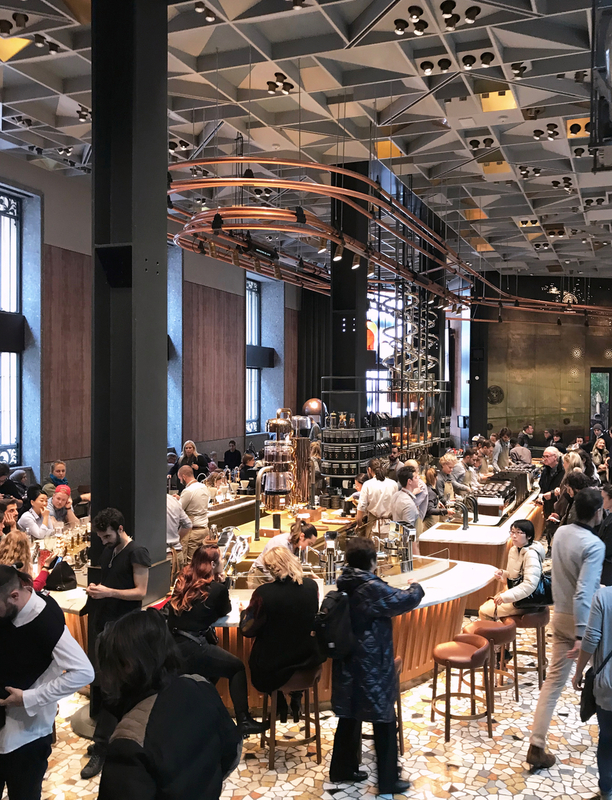 The Starbucks Reserve Roastery is the third expression of this new format devoted to a premium bean, following one that opened in Seattle in 2014 (home of the very first Starbucks, opened in 1971), and another in Shanghai last year. 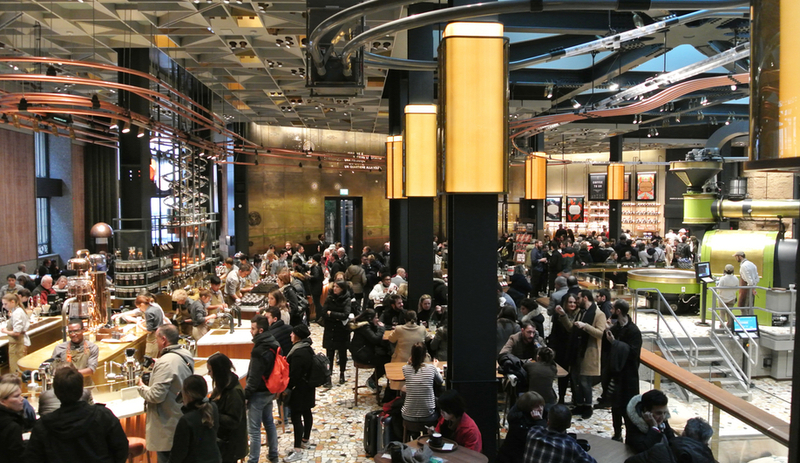 For company chairman Howard Schultz – who experienced an epiphany in Milan in 1983, inspiring him to bring the romance of the Italian café to the United States – the opening of the Starbucks Reserve Roastery in the centre of Milan represents the apex of the company’s hugely successful global enterprise that has brought its fir-green logo and proprietary brew to 78 countries. 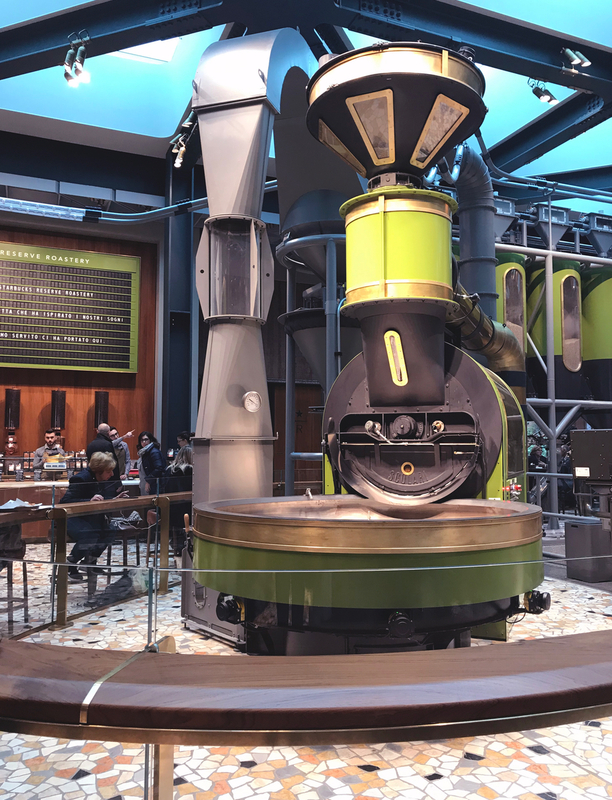 A custom Scolari coffee roasting machine is the centrepiece of the new Starbucks in old Post Office in Milan’s Piazza Cordusio. Master roasters plying their craft entertain the clientele. 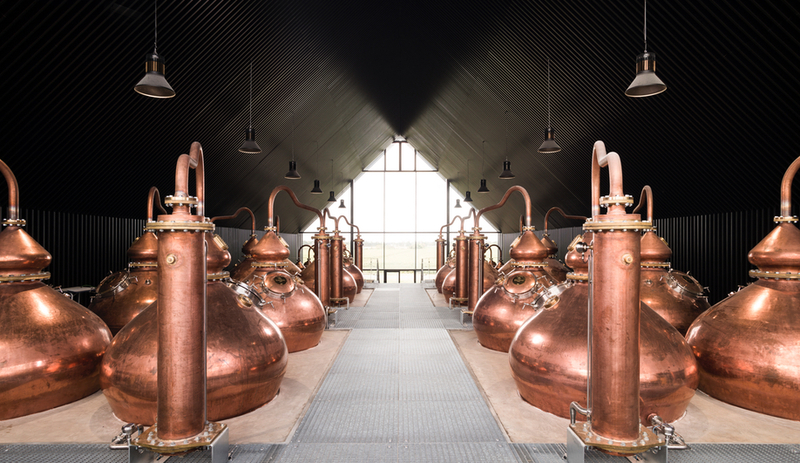 Above the enormous coffee roaster, triangular glass skylights open up the roof, dramatically illuminating the space. In the background, a Solari board with its split-flap letters indicates the blend of small-batch coffee on roast. No expense was spared in creating the crown jewel of the Starbucks firmament. The turn-of-the-20thcentury building that once routed letters has been completely transformed on the inside into an “experience” of the coffee world. The centerpiece is an enormous coffee roaster, produced by the Brianza-based company Scolari. 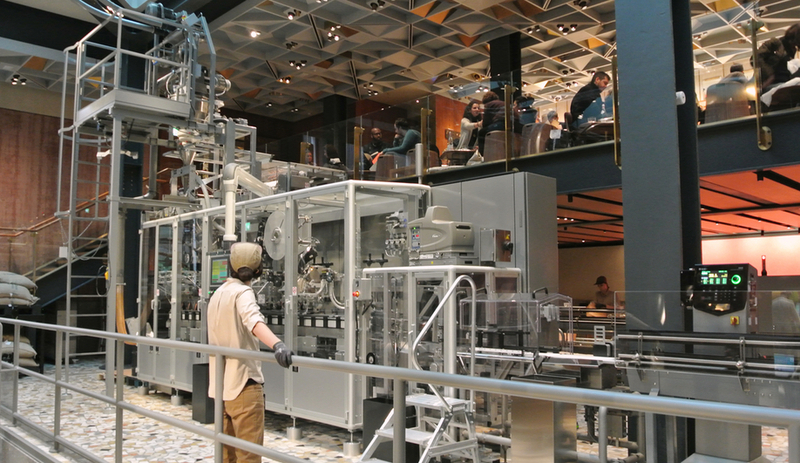 The roasted coffee itself is choreographed into the experience, channeled through a series of tubes (likely inspired by the pneumatic tubes used in Italian post offices for routing letters) to end up either at the bar for immediate consumption, or at an impressive packaging assembly line for retail purchase. The combined effect of the roaster, the packaging assembly and the tubes reminds one of Terry Gilliam’s Brazil, or Willy Wonka’s chocolate factory. 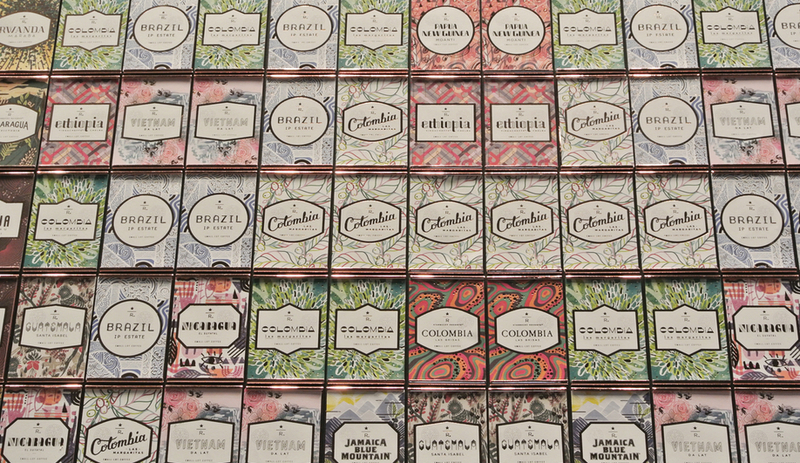 The reserve coffee beans are packed on site, delivered by tubes to the packaging assembly line. On the mezzanine level, a cocktail bar pays homage to the Italian aperitivo tradition. There’s a lot of highly nuanced design in this Starbucks, authored by the in-house team led by chief design officer Liz Muller. The floor is a kind of chunky terrazzo, called Palladiana, found in lots of Italian buildings from the post-war period to the ’60s. 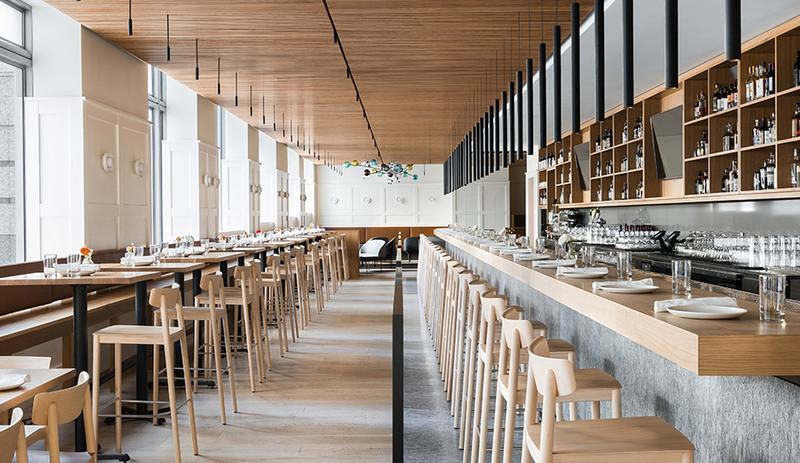 Engineered and produced by Atena, the trapezoidal metal ceiling is a marvel of the small-batch industrial production that Italy is now famous for. It was produced in sections of which no two are alike. 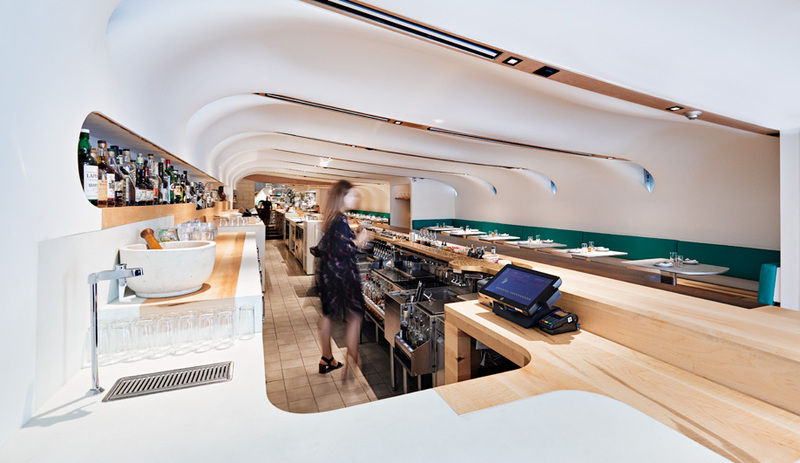 In a paean to the aperitivo culture that has engulfed all of Italy, a mezzanine-level space serves cocktails on a 12-metre-long bar carved from a single block of marble. The bar on the main floor has a radiant-heated top made of Calcutta Macchia Vecchia marble, quarried in Tuscany. 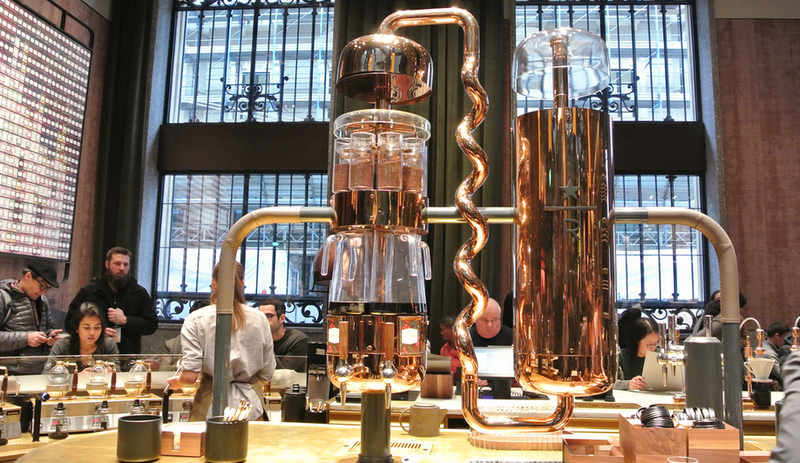 Metal tubes deliver roasted coffee from the Scolari machine directly to the bar. The flooring throughout is Palladiana terrazzo. 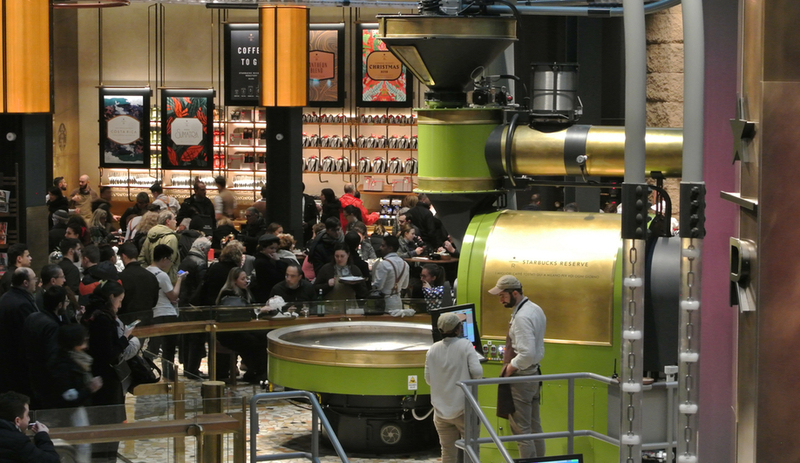 Adjacent to the coffee roaster is a massive cask, hand-made of burnished brass, where the roasted coffee beans go to rest before packaging or consumption. The main floor bar, where the coffee is consummated, has a heated top made of Tuscan marble supported by a carved teak base. Across from the bar, heralding an important partnership with the Milanese bakery Princi, a wood-fired oven turns out perfect pizzas. Nearby, a Solari board, with its split-flap letters and numerals that were once standard fare in train stations and airports, displays information about the special small-batch coffee blend on roast at the moment. The boards had already been imported into the Starbucks décor lexicon, but this is the first time one has been used in the country where it was invented. Brass tubes at the main coffee bar. A feature wall displays some of the Reserve brands roasted and retailed in the Milan Starbucks Reserve Roastery. For those of us who grew up with a solid belief in the immortality of the postal service, the idea of its temple readapted to a coffee circus, a cirque du soleil of javaland, is perhaps not a worst-case scenario. After all, the most important thing the post office ever did was maintain human connections, and the Starbucks Reserve Roastery is doing a great job of that. It is literally thronged with people – taking pictures, drinking coffee, eating pizza. Three hundred young people were recruited for positions ranging from barista, to coffee roaster to pizzaioli. Bravo Starbucks. The former Palazzo della Posta in Milan’s Piazza Cordusio was designed by Luigi Broggi and built in 1901, originally for the Milan stock exchange.